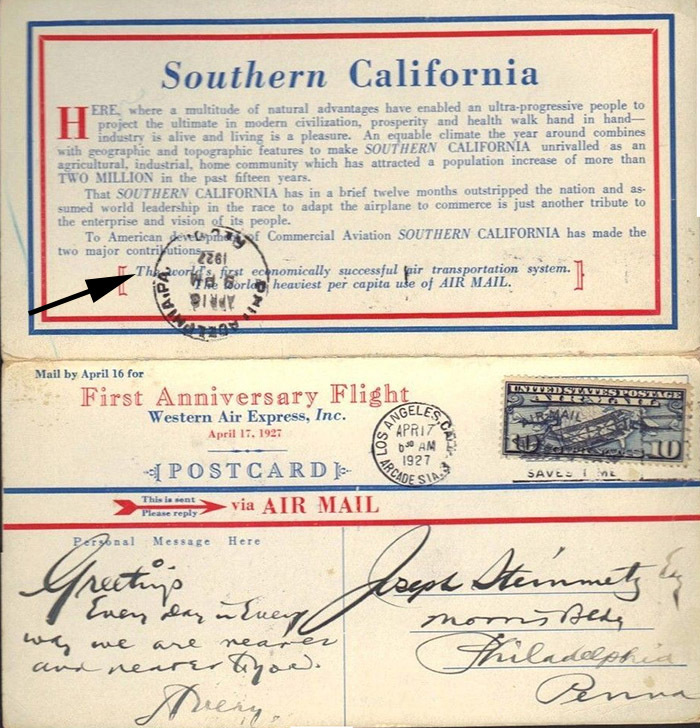 Western Air Express stakes its claim as being “the world’s first economically successful air transportation system” (as shown in the postcard shown below commemorating the First Anniversary of the inaugural airmail flight of Western Air Express). While some airline ventures in various parts of the world began passenger service before Western Air Express, Western Air Express boasts of being the first to reach profitability – doing so starting in 1926, its first year of operation. HERE, where a multitude of natural advantages have enabled an ultra-progressive people to project the ultimate in modern civilization, prosperity and health walk hand in hand – industry is alive and living is a pleasure. An equable climate the year around combines with geographic and topographic features to make SOUTHERN CALIFORNIA unrivalled as an agricultural, industrial, home community which has attracted a population increase of more than TWO MILLION in the past fifteen years. That SOUTHERN CALIFORNIA has in a brief twelve months outstripped the nation and assumed world leadership in the race to adapt the airplane to commerce is just another tribute to the enterprise and vision of its people. The world’s first economically successful air transportation system. The world’s heaviest per capita use of AIR MAIL. Western Air Lines, is the only survivor of a handful of airlines that pioneered commercial air transportation in the U.S. in the mid-twenties…[Its first route in 1926] gave Los Angeles its first transcontinental air service and put Southern California on the air mail map. Aviation was in its infancy in those days and there was a certain amount of bravado attached to facing the elements in the open-cockpit planes. Standard equipment for passengers was a flying suit, goggles, gloves, parachute and lots of courage. Much to everyone’s surprise, when 1926 came to a close, Western had a net profit of $28,674.19. And by October 1927, Western became the first airline in history to pay a cash dividend to its stockholders. What the Sacramento Valley Railroad had once portended for transportation in California and the West was not lost on Harris Hanshue, a Los Angeles airline executive. Writing nearly seventy-five years later in Aeronautics magazine, he dared to compare his airline, barely four years old, to the state’s pioneer railroad, which despite its auspicious beginnings had become an integral part of an important industry. Hanshue’ s essay was remarkably prophetic because Western Air Express, the carrier he headed, had recently become the first airline in the United States to make a profit carrying passengers without the benefit of a federal airmail subsidy.